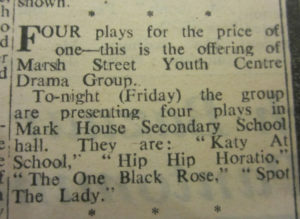 As is shown in the above clipping, ‘Four Plays for the price of one’ – is the first line of this very very brief – but ‘historical helpful’ – ‘What’s On’ item found in the late December 1962 edition of the Walthamstow Guardian Newspaper. Unfortunately there was not a report of the actual performances in the following week’s edition, but nevertheless this little piece of memorabilia does, at least, add to the Drama Club’s overall listing of productions and also shows that one of this number – Douglas Bryce-Pitt’s version of Macbeth – ‘Spot The Lady’ – was performed three years running. So – a previously forgotten fact, but one that is not too surprising both because of its hilarious script and fast and furious pantomime-ish style performances so enjoyed by both cast and audience and that it was the Drama Club’s entry in entry into the Essex Youth Drama Festival the following month! ‘Spot The Lady’ is also shown in the Website’s production listing for the Essex Youth Drama Festival in January 1963 and, given that this was only one month later, perhaps suggests that this earlier version had the same cast – probably a timely piece of planning and preparation for ensuing competition? ‘Kenneth Tydeman’s, ‘Hip Hip Horatious’ was an equally funny and quirky to stage – and, as with ‘Spot the Lady’ was similarly much enjoyed by its cast – and perhaps between them began to sow the seeds of thought – that ‘December Productions’ ought to be Panto’s – which did, of course, come to be the case not too long after! 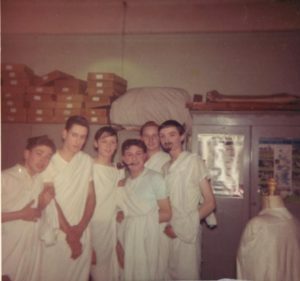 Excepting this single photograph of part of the cast of ‘Hip Hip Horatious, no other memorabilia has been found of the Drama Club’s production of Kenneth Tydman’s One Act ‘mini drama’ of life in Ancient Rome. The absence of a programme therefore leaves an unanswered question of whether the 6 toga clad plebians, shown below in assorted bed-sheets were main characters or ‘the baying mob’. The latter probably looks more likely – especially the headless one in the foreground! Part of the cast of ‘Hip Hip Horatious’ Barry, Fred, Gordon, Dave, Jimmy, Gerald and (far right) A N Other? However, despite these unanswered questions, Wikipeadia provides a ‘read worthy’ humorous and interesting outline of what it describes as a ‘rumbustuous parody of Macauley’s poem Horatious’ – along with details of the character list which is reproduced below. This account also suggests some really hilarious passages and lines – amongst which, it states, the baying mob was not demanding ‘bread and circuses’ but ‘beer and bingo’!